KALAMAZOO, MI -- A 14-year-old girl was almost pronounced dead prematurely after being shot in a Kalamazoo, Michigan, Cracker Barrel parking lot. Lieutenant Dale Hinz with the Michigan State Police tells ABC he spoke with the parents of the 14-year-old shooting victim, who was initially reported dead early Sunday morning after the Saturday evening rampage by alleged shooter Jason Dalton, 45. Lt. Hinz says the girl was pronounced brain dead shortly after arriving at Bronson Methodist Hospital. The family told Lt. Hinz that an hour or two after that, the hospital was in the process of preparing her organs to be donated. That's when the girl squeezed her mother's hand. Hinz says the mother then asked her daughter to squeeze her hand again if she could hear her, and she did. The doctor asked the girl to give a thumbs up if she could hear him, and she gave two thumbs up. According to Lt. Hinz, the hospital then immediately started prepping the 14-year-old for surgery. As of 5 a.m. CT Monday, the girl is still hanging on, but there is no change in her condition. Authorities are still trying to piece together the hours-long weekend rampage that left six people dead in western Michigan. Dalton, an Uber driver and former insurance adjuster who police said had no criminal record, was arrested in connection with the shootings after a massive manhunt and was expected to be arraigned Monday. Authorities did not provide a motive for what they said was his targeting of victims with no apparent connection to him or to each other in the Saturday night shootings. "How do you go and tell the families of these victims that they weren't targeted for any reason other than they were there to be a target?" Kalamazoo County Prosecutor Jeff Getting said at a Sunday news conference. Kalamazoo County Undersheriff Paul Matyas described a terrifying series of attacks that began about 6 p.m. Saturday outside the Meadows apartment complex on the eastern edge of Kalamazoo County, where a woman was shot multiple times. She was expected to survive. Fifteen minutes after that, five people were shot in the parking lot of a Cracker Barrel restaurant, Matyas said. Four of them died. "These are random murders," Matyas said. Dalton was arrested without incident about 12:40 a.m. Sunday after a deputy spotted his vehicle driving through downtown Kalamazoo after leaving a bar parking lot, authorities said. Matyas declined to disclose anything found in the vehicle except for a semi-automatic handgun. By midday, authorities were investigating a Facebook post that indicated the suspect was driving for Uber during the manhunt and had taken at least one fare, Getting said. Dalton's wife and children were unhurt, authorities said. The suspect was in contact with more than one person during the rampage, authorities said, but they would not elaborate. Prosecutors said they did not expect to charge anyone else. Authorities were interviewing Dalton and reviewing his phone. They did not know if the handgun belonged to him, Getting said. "This is every community's nightmare - when you have someone going around just randomly killing people, no rhyme, no reason," Getting said. Tammy George said the woman who was shot outside the apartment building is her next-door neighbor. She and her family heard the gunfire, ran outside and saw the woman on the ground. Four bullets flew into a closet of George's home, she said. Her son, James, was playing video games with two friends a few feet away from where the bullets pierced the wall. "I checked out the back window and saw a car speeding off," said James George, 17. On Sunday morning, Tammy George came outside to clean the parking lot. "I was worried about the kids coming out and seeing their mom's blood," she said. "I cleaned it up. No kid should have to come out and see their parent's blood on the ground." During a Sunday morning news conference, some law enforcement officials wiped teary eyes or got choked up. When the news conference ended, Kalamazoo Mayor Bobby Hopewell and Department of Public Safety Chief Jeff Hadley embraced. 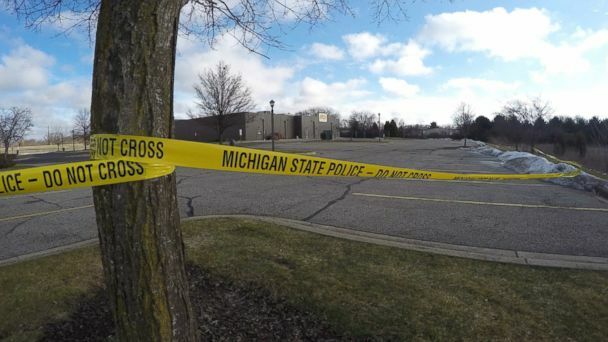 The four people killed outside the restaurant were identified as 62-year-old Mary Lou Nye of Baroda and 60-year-old Mary Jo Nye, 68-year-old Barbara Hawthorne and 74-year-old Dorothy Brown, all of Battle Creek. The two victims killed at the car dealership were identified as Tyler Smith and his father, Richard, who was 53. A 14-year-old girl wounded at the restaurant was hospitalized in critical condition. Late Sunday night, mourners streamed into a Kalamazoo church for a prayer service intended to honor the victims and help residents cope. With a population of about 75,000, Kalamazoo is about 160 miles west of Detroit. It is home to Western Michigan University and the headquarters of popular craft beer maker Bell's Brewery. The city also is known for the anonymously funded Kalamazoo Promise program, which has paid college tuition of students who graduate from Kalamazoo Public Schools for more than a decade.